"I just might have to break up with her. We aren't righty-wight for each other..."
As soon as I'd finished speaking, my friend's face contorted into an expression of stern disapproval. "But she's exactly your type, Hakka-Rokka. You told me yourself that you wanted someone cheerful and outgoing." "Don't try to say you didn't. I remember you came swaggering up to me like you'd just won the Mog Bonanza, bellowing, 'Hey! Hakka's been waitin' for you! You find Hakka his sociable sweetmeat yet or what?' at the top of your lungs," he mimicked. My friend had fought alongside me in the same party for a whole year, so of course his impersonation was admirable. He is a Hume, however, so he can't quite mastaru our unique speech patterns. He was right, though—that's exactly what I said. As is tradition on Valentione's Day, the less fortunate in love break off half a chocolate heart and entrust it—as well as the search for a suitor—to a better-connected comrade. Chocolate in hand, he traversed the dusty streets of Windurst for me until the colors of his tunic and trousers were indistinguishable from that of the dirt underfoot—and he'd found an exceptional girl for me. Or, to be more precise, she matched my request to an exceptional degree. That Valentione's Day, I may have looked the way I always had, but the real me had been left grounded in favor of a more upbeat personality. I had just slain my first notorious monster in a battle that will forever be etched in the annals of...well...no place important. Still, I was flying high from the rush that accompanies slaughtering a savage beast, and my pride got the better of me. I felt as if I could level buildings with a dismissive backhand and cause castles to crumble with my laughter. I was so overcome by hubris that I even...began referring to myself in the third-person. How embarrassing. In reality, I'm no stronger, braver, or less deplorable than an ordinary adventurer, so I had no basis for behaving like a legendary hero. Yet, there was a method to my madness. I only did these things so I could appear outgoing to the girl I met on Valentione's Day. I spent my whole year with her under this façade of sociability and self-confidence, schmoozing with her at the Sunbreeze Festival, corralling calves during Blazing Buffaloes, and basically playing the extrovert at every event on the calendar-walendar. But...me—a humble Taru—using the third person! I just can't take any more of this pathetic farce. I'm through putting on airs just to be with someone who deserves better. "We're too differentaru, that's all. But I am thankful that you introduced me to her." "It's all my faultaru! I was still flying high from all the loot I got the day before!" I lamented, my back propped against the Great Star Tree for support. "I think you should talk it over with him before making a rrrash decision, Nakoko." "My knightaru in shining armor! I've been waiting for you!" I chimed naively as I relinquished the other half of my chocolate heart. I was already an adventurer at that point, so I should never have relied on others to find the right Taru for me—and I certainly never should have said that extroverted, outgoing guys were my type! Oh, the embarrassment! I felt like crawling into a treasure casket that locks from the inside and dying. Yet, there was a method to my madness. I only did these things so I could appear outgoing to the guy I met on Valentione's Day. I spent my whole year with him under this façade of sociability and self-confidence; I...I even wore a bikini for him when we went to Bibiki Bay! I just can't take any more of this pathetic farce. I'm finished with putting on airs just to be with someone who deserves better. "I...just don't think we're compatible-watible..." I struggled to eke out, afraid to even make eye contact with my friend. To tell the truth, my personality is the exact opposite of what I'd led Hakka-Rokka to believe. I'm a terrible craven who's even scared of her own shadow—which is why I don't think I have any courage left to meet him agai...Huh!? I had to rub my eyes to make sure I wasn't dreaming. Where no one had been but moments before, there were now two young men—one a Hume, the other a Taru—standing apprehensively, feebly trying to catch our attention. "Ha-Hakka-Rokka!? Wh-wh-what are you doing-wooing here!?" They must have used Invisible to sneak up on us! But putting a reason to the rhyme did little to quell the heat of mortification that emanated from my face. How much did they hear!? "I...um, I just kind of followed my friend here...because he told me to..." Hakka-Rokka stammered as his eyes remained fixed on the ground. "This pretty maiden is as shy as they come, Hakka-Rokka. She's right up your alley!" "I've found the perrrfect companion for you, Nakoko! He's the biggest introvert I know!" My eyes widened, locked on Hakka-Rokka in a disbelieving stare. "The biggest introvert you know is..."
"This 'pretty maiden who's as shy as they come' is..."
Hakka and I simultaneously let out an awestruck "You must be kidding-widding me," followed soon after by an uncontrollable bout of relieved laughter. We really were meant for each other all along. Acting out of what seemed like instinct, we nervously extended our chocolate heart halves toward each other. The closer they came, the more palpable our anxiety became, until they finally slid together as if they had never come apart. Never had a simple candy tasted so satisfying, so complete. Hakka's breath intermingled with mine as we nibbled timidly on that sugary succulence of romance manifest, my composure pushed to its limits. The shy smile that crossed his lips next as our eyes met proved to me that this Valentione's Day was only the beginning of a long-lasting love. 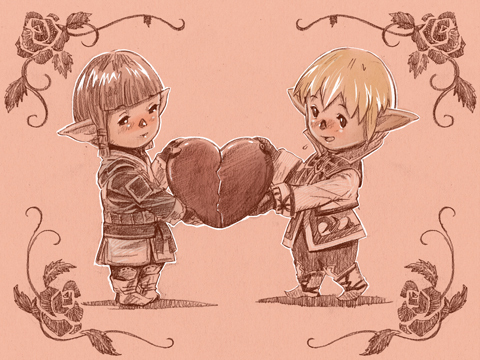 The Valentione's Day event will commence at midnight (PST) on Wednesday, February 1, 2012, and conclude at the same hour on February 15, 2012. Looking to join in the festivities? The moogles stationed in the areas below will fill you in on all the scrumptiously sweet details! Valentione's Day is all about you amazing adventurers, so to celebrate your greatness, we'll be proffering a positively pleasant present to everyone. Delivery of this delightful doodad will commence on Tuesday, February 14, 2012. - All characters created before 7:00 a.m. (PST) on February 7, 2012 will be eligible for this offer. - It may take time for the gift to reach your delivery box, so please be patient if it is not delivered immediately. - Possessing over 255 items in your delivery box may cause delivery issues. - You will be unable to receive your gift if you use the World Transfer service before retrieving it from your delivery box. We are unable to resend presents, so please be sure to retrieve the item before transferring.